Charlie did not really want to come to the sleep doctor. “I sleep just fine,” he told me gruffly at our first consultation. 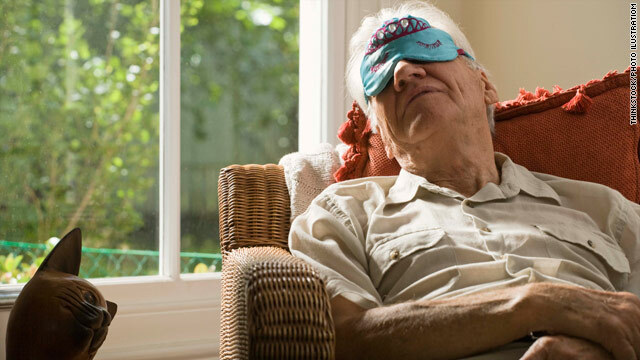 Many studies show that approximately 50 percent of people over the age of 65 have complaints about their sleep, but this 75-year-old man declared that he was not one of them. However, his internal medicine doctor and his daughter had insisted that he have his sleep looked into. They felt that his memory had deteriorated over the past year and they wondered if he could have a sleep disorder that was robbing him of quality sleep and making him confused and forgetful in the daytime. Indeed, such problems with mood and memory are often multi-factorial in elderly patients. In Charlie’s case, not only was he depressed and in the early stages of presumed Alzheimer’s disease, he also had multiple sleep problems that were only discovered after testing and getting to know him better. He did have very severe sleep apnea and surprisingly he did not resist the CPAP treatment and he acclimated very well to it. He seemed a bit brighter in the daytime, but he had also started a medication for Alzheimer’s disease and for depression, so it was hard to say what was helping him. After three months with CPAP, he did have a sleep complaint: “Doc, now I am waking up at 3 a.m. and I am wide awake and can’t go back to sleep.” Well it turns out that he has been going to bed at 7 p.m. for a long time, but when he had his sleep apnea and his depression treated, his sleep was such poor quality that he slept until seven a.m. and never thought to tell anyone he was sleeping for twelve hours. Now that his sleep and mood were much improved, he needed only eight to eight and a half hours sleep and he was waking up raring to go, but that was usually at 3 or 4 a.m. because he was still going to sleep at 7 p.m. usually in a chair in front of the television. So Charlie had a circadian rhythm disorder called advanced sleep phase syndrome whose signs and symptoms had been masked by the long sleep times associated with the other sleep disorder. People with advanced sleep phase disorder get very sleepy around 7 to 9 in the evening and want to go to bed. Their sleep is otherwise normal if they have no accompanying sleep disorders. The problem is most people don’t want to start their day at 3 or 4 a.m. This disorder is most common in older adults, but it can be caused by a genetic mutation and those people can display advanced sleep phase early in life. In older adults, there is a decrease in melatonin secretion and this may play role in circadian disturbances. There are always many studies that show that elderly people get much less bright light than younger people, and I have explained in many other blogs, light is the strongest Zeitgeber (time keeper in German) and provides the strongest stimulation to our wake-promoting neurons. Therefore, the first-line treatment for circadian rhythm disorders is bright light therapy sometimes accompanied by melatonin, but the timing of each of these therapies is critical. For Charlie, we had him turn all the lights on in his house at 7 p.m. and he kept them on until 9 p.m. His goal bedtime was now 10 p.m. I saw him one month after these recommendations and he was sleeping from approximately 10 p.m. until 6 or 6:30 a.m. He avoided bright light for an hour or so in the morning if he could. He did not need the addition of a commercial light box or melatonin. When I marveled at how easily he was able to change his schedule, he admitted other changes that helped him: “I do my exercises in the early evening now, and I eat dinner later, and when the bright lights go on I sit in a hardback wooden chair instead of my recliner.” This is not something I plan to recommend to all my patients, but it worked for him so who was I to dissuade him from his proven methods? « Previous entryTexas man gets first full face transplant in U.S. I am extremely impressed with your writing abilities and also with the format on your weblog. Is that this a paid theme or did you customize it your self? Anyway keep up the excellent quality writing, it is rare to peer a great weblog like this one these days..